Frank Frazetta was the best. His vision defined a genre and inspired multiple generations. It's sad that the man is gone, but that vision remains and is just as powerful as ever. What better legacy could any artist hope for? Rest in peace, sir, and thank you. 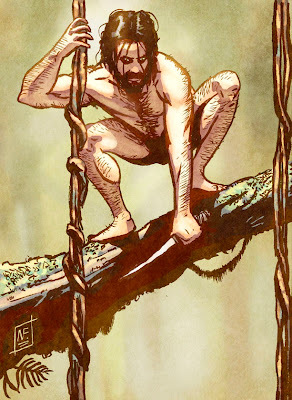 That is one wild looking Tarzan! Great piece. Um, when did this become a naked Alan Moore tribute? JK! I love this Nathan. It's kind of a real-world Tarzan. Leaner, meaner, hairier, wilder! I've already told you I love the colours but I wanted to also say that I really like the way you chose to make him a menacing and dangerous character instead of Burroughs' idealized noble savage.